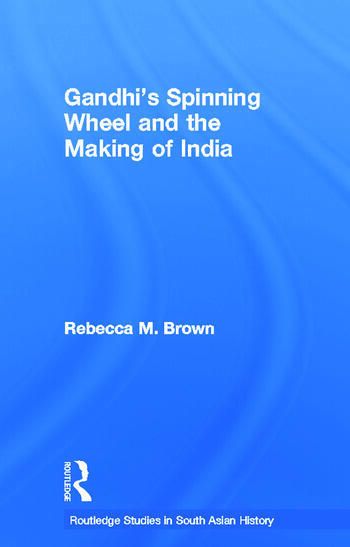 Gandhi’s use of the spinning wheel was one of the most significant unifying elements of the nationalist movement in India. Spinning was seen as an economic and political activity that could bring together the diverse population of South Asia, and allow the formerly elite nationalist movement to connect to the broader Indian population. This book looks at the politics of spinning both as a visual symbol and as a symbolic practice. It traces the genealogy of spinning from its early colonial manifestations in Company painting to its appropriation by the anti-colonial movement. This complex of visual imagery and performative ritual had the potential to overcome labour, gender, and religious divisions and thereby produce an accessible and effective symbol for the Gandhian anti-colonial movement. By thoroughly examining all aspects of this symbol’s deployment, this book unpacks the politics of the spinning wheel and provides a model for the analysis of political symbols elsewhere. It also probes the successes of India’s particular anti-colonial movement, making an invaluable contribution to studies in social and cultural history, as well as South Asian Studies. Rebecca M. Brown is visiting Associate Professor in Political Science and the History of Art at Johns Hopkins University, US, researching colonial and post-independence in South Asia. Her publications include Art for a Modern India, 1947–1980 (2009) and Asian Art (co-edited with Deborah S. Hutton, 2006).